The Leave No Child INSIDE Central Ohio Collaborative is a member of the Children & Nature Network. The vision and mission of the Children & Nature Network is to give every child in every community a wide range of opportunities to experience nature directly, reconnecting our children with natureâ€™s joys and lessons, its profound physical and mental bounty. 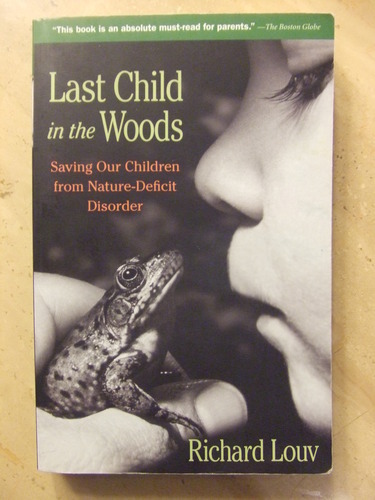 In 2005, Richard Louvâ€™s book â€œLast Child in the Woods: Saving Our Children from Nature-Deficit Disorderâ€ was published. It was the first book to bring together a growing body of research that shows a link between the absence of nature in todayâ€™s wired generation to some of the most disturbing trends in children, including obesity, attention deficit disorders and depression. It confirmed what most people instinctively know: that frequent play in nature is essential for the healthy development of our children. Almost immediately after its publication, this book inspired grassroots initiatives across the country, as people recognized the need to reconnect our children with nature. In October of 2007, a group of individuals and community organizations around Columbus came together to form The Leave No Child INSIDE Central Ohio Collaborative. The group connects existing natural parks and playspaces with youth and parents, plus child-care facilities and schools, and works to educate the community about the importance of nature to healthy childhood development. Since then, the group has grown tremendously, linking camping, parks, schools, health organizations, hospitals, urban planners, elected officials, teachers, students and parents who are passionate about the issue. Each fall, we hold a summit to encourage networking, inspire members, and work on the growth and direction of the Collaborative. Throughout the year, we concentrate on education, speaking to groups, pursuing earned media opportunities, lobbying for environmental education funding, and continuing to be a valuable resource for our members through our blog and weekly email. More informationÂ availableÂ in theÂ Annual Report 2011 and Annual Report 2013.